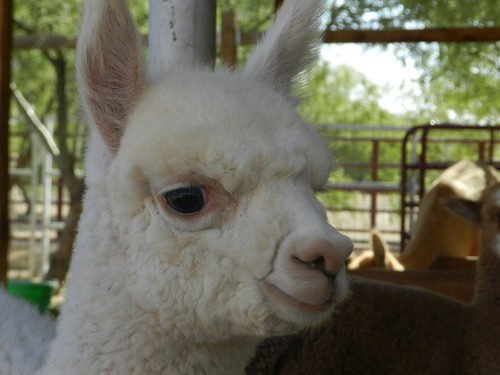 Alpacas are a very special and magical animal. These delightful creatures each have unique personalities that will make you fall in love with them. This is what happened for all alpaca owners across the country. 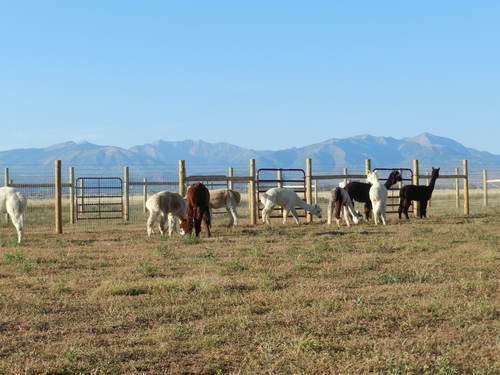 While we are all in the business of raising these animals for their exquisite fiber, breeding and selling of the animals, it is the awesome alpaca themselves that makes us all very fortunate to own them and be in the business. Alpaca fiber is a luxury fiber and is not yet processed commercially by large mills in the United States. 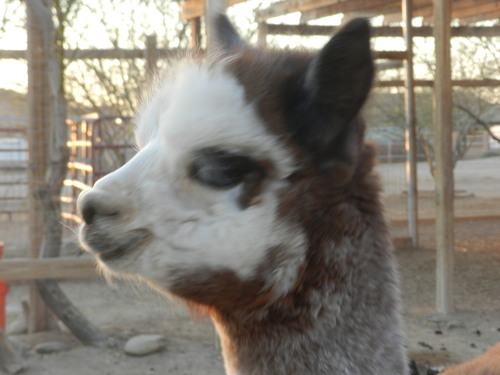 Processing is by alpaca owners themselves or by small cottage mills across the country. This is one thing that makes this fiber still so unique and special. Alpaca fiber is a lustrous lightweight fiber that is 3 times warmer than wool, is naturally hypoallergenic, does not contain lanolin, is very strong and as soft as cashmere. The fiber is natural in 16 shades from white, fawn, browns, blacks and greys. Alpaca fiber can also be dyed into any beautiful color that you can imagine without losing its quality and sheen. 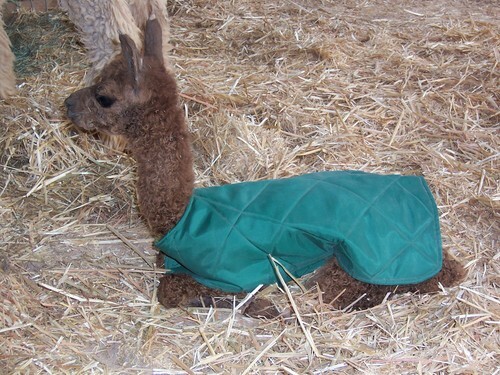 Soft and warm alpaca fiber is processed into yarns, socks, hats, gloves and other garments. Hand spinners love to spin with alpaca fiber and many of the ranches will process fiber into batts for felting and quilting or rovings for spinners. The possibilities are endless for uses for alpaca fiber. Beautiful hats, purses and vests are among the items from felted alpaca fiber. Knitters and crocheters go crazy with alpaca yarn for hats, scarves, gloves and many other projects. 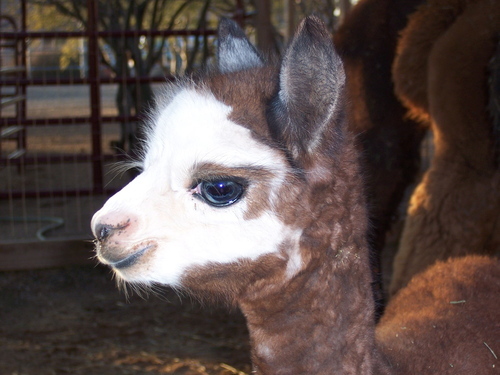 Baby alpacas are called "cria" and seeing a chosen breeding decision result in a beautiful new alpaca is thrilling. 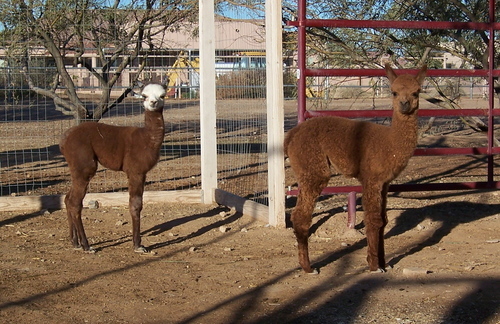 The pictures shown here are all cria (6 months old or less). Crias amaze and amuse daily! 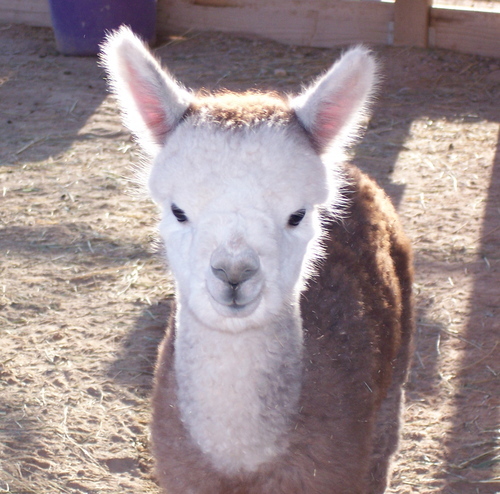 Alpaca breeders across the world are all dedicated to the business of raising alpacas and their well being is first and foremost for all breeders. 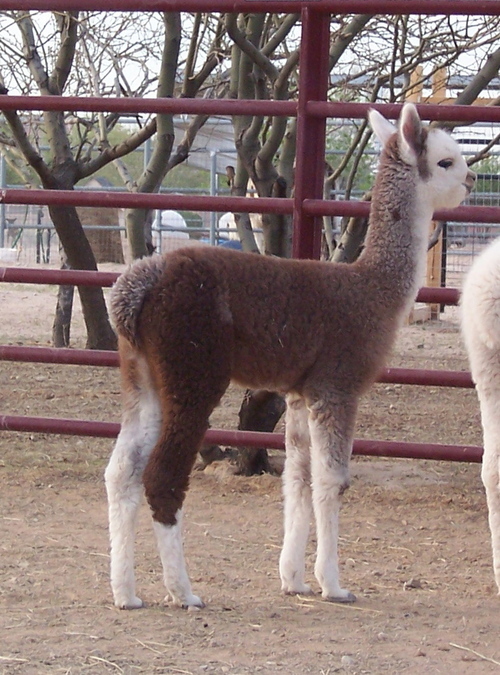 Alpaca breeders come from all walks of life and some raise alpacas as their sole business while many others still hold “day jobs” and dream of the day that alpaca ranching is their only business involvement. 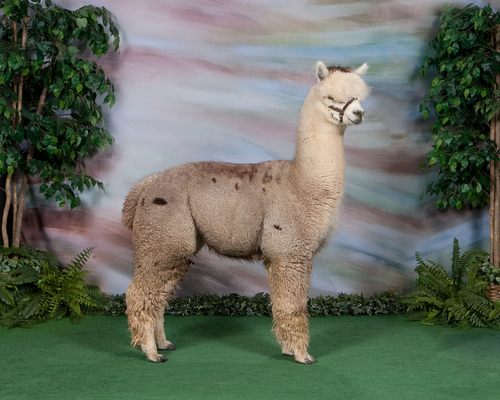 Once you come face to face with an alpaca it is guaranteed that you fall in love with the exquisite creature. After all, who can resist big beautiful brown eyes and happy humming?! Some of our girls enjoying the view! We are finally HOME! After years of planning, hard work and lots of determination, we have finally gotten moved back home to Colorado. 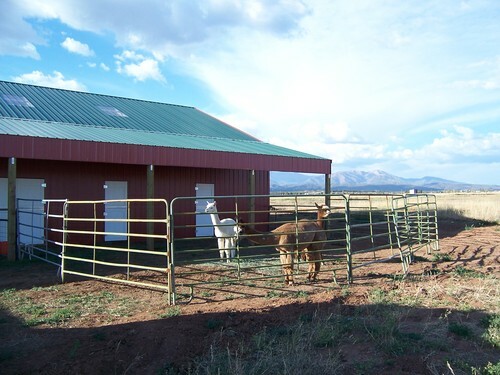 Our wonderful 35 acre ranch in Hesperus, CO is now home to our herd of 25 +/- quality alpacas. While there is still a TON of work to do and at times, it is a bit overwhelming, we could not be happier. We have a wonderful barn, a great house, very nice alpaca pens and meeting great new neighbors! 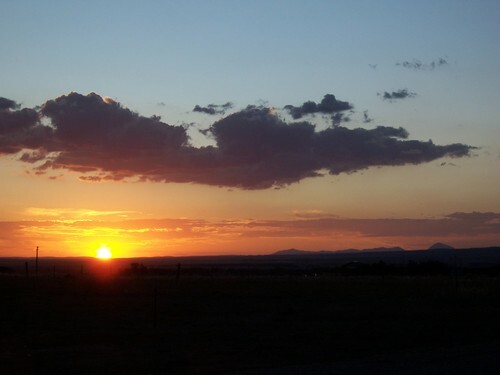 As we are enjoying a very nice and mild fall here in southwest Colorado we know that winter is just around the corner. Yes, that will bring new challenges as we have been out of Colorado winters for 18 years. Time to shop for BOGS and Carharts! Thankfully we have our warm alpaca socks, gloves and hats! Work is never ending but at times it does not seem like work. 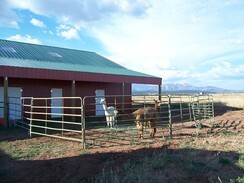 We are doing what we have dreamed about with having our alpaca ranch here in Colorado. Building shelters, setting up more pens, etc is time consuming but all to a good end. Our own herd is about 25 strong and we now are also agisting for 3 other ranches. 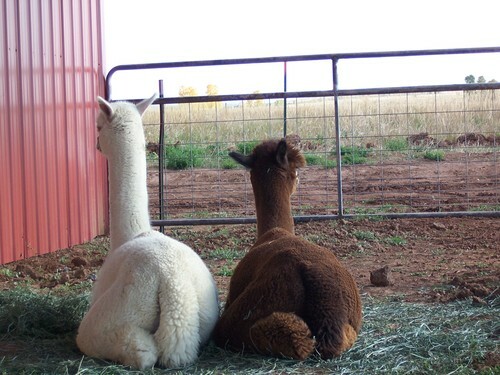 We appreciate the fact that other alpaca owners trust their herds to our care. We will treat them as our own with care and attention. 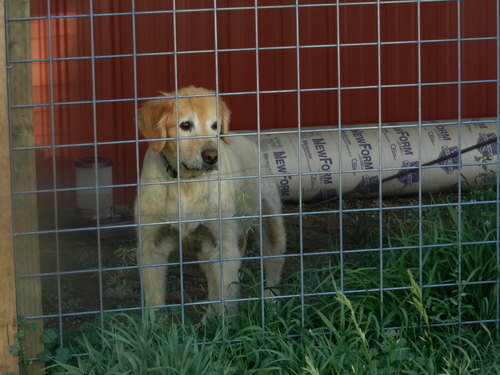 One sad note is that our beloved golden retreiver, Durango, passed to doggy heaven only 5 short days after we got moved. He was ill but bravely made the trip with us and actually got a little extra energy to trot through the alpaca pens and also enjoy being in Colorado. RIP Durango. We miss you buddy! Come visit us! We offer sales, agisting, breeding and products. Our dear Durango- we miss you! Almost! We are ALMOST home! The early morning sun on our home! 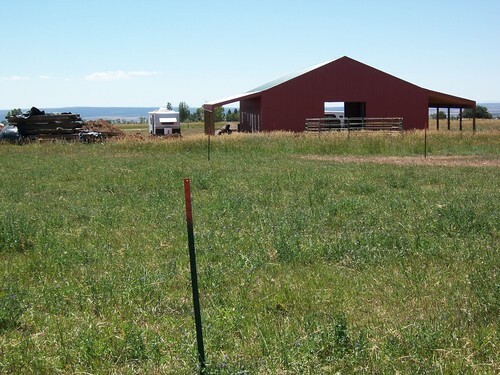 We are almost ready for our BIG move to our new ranch in Hesperus, CO. Alpaca pens are fenced in, barn is ready and the human house is 99.9% finished. 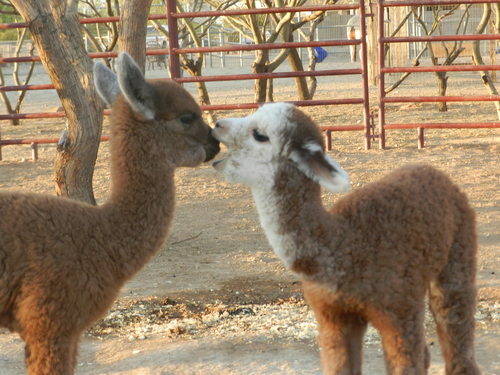 Aww, who cares about the human house, it is the alpacas that count! Counting our way down to Labor Day weekend which is now slated for our move home. It has been a long year and tons of blood, sweat, tears and laughter along the way. 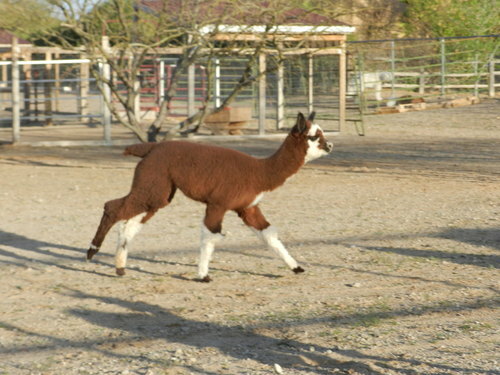 Getting settled into the house and getting our alpacas to our ranch is utmost on our priority list right now. 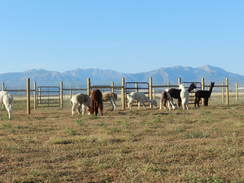 Stick with us to see pictures of when the alpacas actually arrive to our ranch from their summer agisting home. We need to send a HUGE thank you to Jim and Lois Burbach at Navajo Lake Alpacas and Blair and Karen Christensen at Bluebird Alpacas for hosting our herd all summer. You guys are the BEST and we could not have done this without your help and support! Two more cria......one more to come! 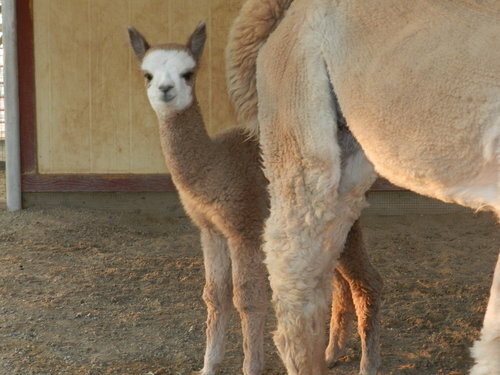 We have had two new cria hit the ground since our last blog. 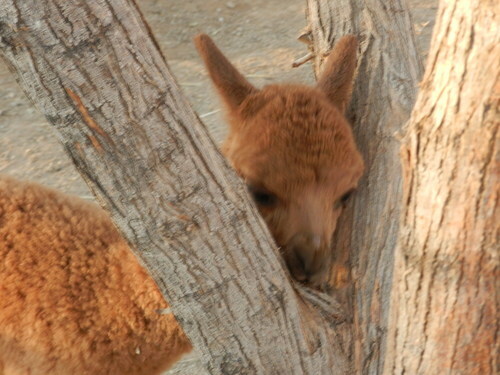 It is always exciting to see new cria! still waiting one one more (as of June 3 mom is at day 352). Lady Felina graced us with her presence on April 18th. While all appeared fine the first day, Felina started losing weight in the first 3 days. Her dam Mary was suffering from a mild case of mastitis. 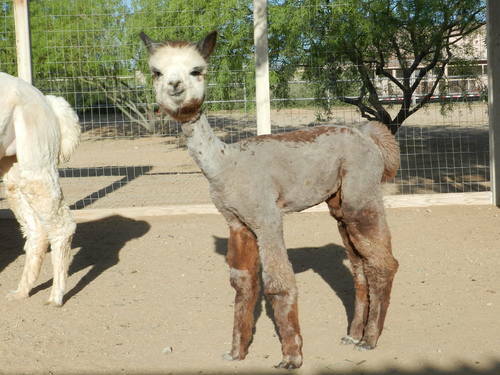 Once we got that taken care of, Felina started on a steady daily weight gain and is now a beautiful and proud little alpaca. Her adorable face will steal your heart! We believe her to be a light rose grey and sports the classic white face. Once again her sire, Adonnis' Altitude NS had done an incredible job! We are looking forward to showing this little girl starting in the fall of '12! Durango Willy arrived one week later on Aril 24th. Knowing his dam's history and the sire that she was bred to (a Poseidon son) we predicted a 20 lb white male. We were wrong.........it was a 21.4 lb white male! This young male is loaded with long crimpy fiber. Crimp runs from tail to topknot. If you are going to have a white male, it had better be a good white male and we think Willy is just that! As always, it is fun to watch cria play and we get such a kick out of seeing little Felina bulldog her way with Willy. At about 1/2 of his weight at 6 weeks of age, she has to throw her whole body into him. The little lady shows who is boss! One of the things that you hope for in a herdsire is for him to throw himself or better and to have the traits of himself shine through. We are so pleased with Adonnis' Altitude as with each new cria that is from him, we see the positive traits. 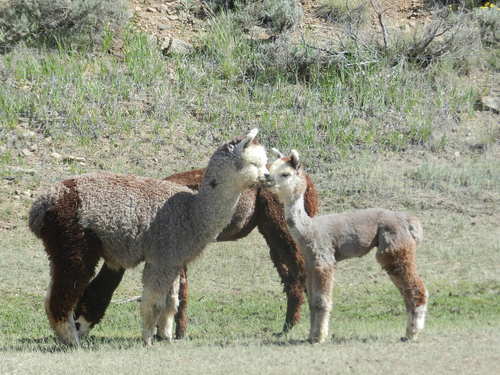 Take a look at these pictures of Altitude as a cria and pictures of 3 of his offspring. Note the head and the stature. Strong, straight, big boned. We feel that his most recent offspring, Altitude's GreyHawk just might become superior to Altitude as he grows. Fleece characteristics of the cria that he has sired are all very nice. We feel that Aerie will benefit from her shearing in May '12. Look for yourself and see that....."the apples did not fall far from the tree" Superior progeny! The end of 2011 and the start of 2012 has been exciting for Pleasant Journey Alpacas. We have 5 wonderful new crias born so far with 3 more still to come. Our goal as a small breeder has been to choose the correct breedings to improve our herd. This crop to new crias has proven to us that we are making this happen. Our very own herdsire Adonnis' Altitude NS has sired 3 awesome young cria for us so far and we are anxiously awaiting the last one from him to arrive in April. 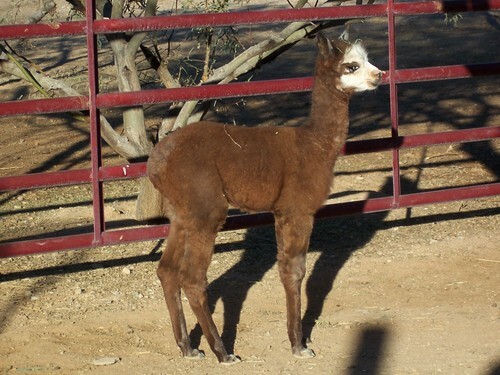 We now have the lines of Gun-n-Roses in our herd with our dark fawn young cria Gunssmoke. We cannot wait to start showing him in fall of 2012! He is everything we could ask for and we know that he will improve with age. To top all that this young gun already offers with stature and fiber, his personality is incredible. Gunssmoke's dam, Bijou, will be bred to our own Altitude in the summer of 2012. 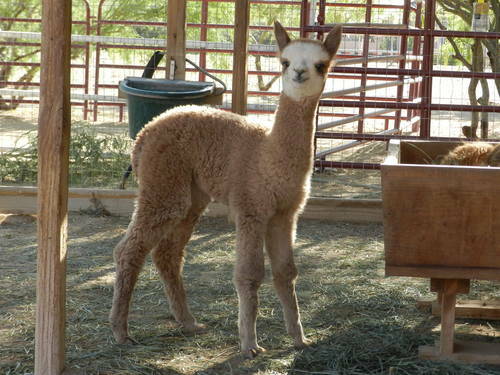 Our second cria this year is beautiful Graycee Spirit. This young girl has lived up to her name with a spirit to overcome the difficulties of weak little ankles for the first week of her life but she was very tenacious. Graycee is from our very own Altitude and this girl is growing up to be a gorgeous rose grey. Watch for her at the shows in fall of 2012. Sleeping Giant's Mr Cash put forth a beautiful beige female for us. Shianna Moon is loaded with beautiful fiber and a stunning presence. Shianna will hit the very competitive show circuit in the fall of 2012. 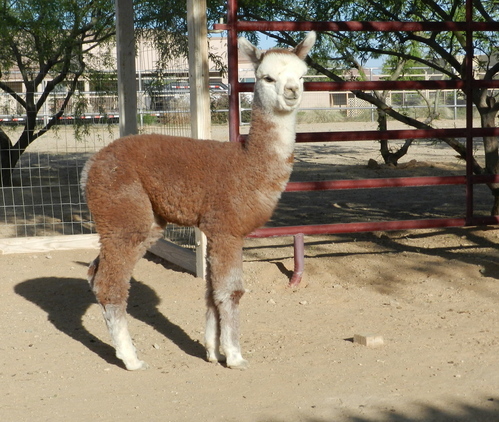 Cowboy is a very large cria that has presence, fiber and a wonderful personality. This boy is a very big boy weighing in over 45 lbs at 2 months! Big bones, stocky frame, straight stature and did we mention fiber? Beautiful! The newest cria on Pleasant Journey Alpaca ranch is Altitude's GreyHawk. At only one week, we can already see that this young guy has what it will take to soar high. Fiber, stature like Altitude...the whole package already shining through. This young male will have what it takes to be a first class rose grey herdsire in a couple of years. Add all of these wonderful cria so far to the anticipation of another Altitude cria from our girl Proud Mary and the new lineage to come into our herd from Crescent Moon's Tia and GearJammer. Wow! Our small herd has grown in size a lot this year but we are so proud and happy with what we are seeing so far. Thank you for checking in with us and look for more blog action to come. 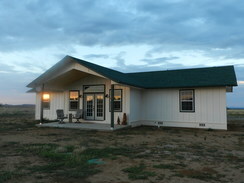 Not only do we have the cria action happening but the house in Colorado is getting started. Wow, we need more hours in a day! We are coming to the end of another year. 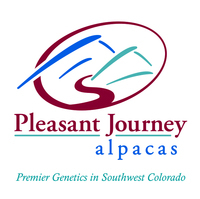 2011 has been quite a year for Pleasant Journey Alpacas. 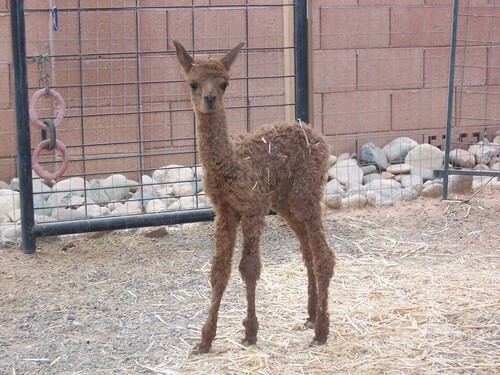 We welcomed the first cria, Aerie from our 2x Color Champion Adonnis' Altitude NS. She is all we were hoping for and more. Watching her grow and mature has been exciting and having her win her first blue ribbon at FallFest 2011 was wonderful. 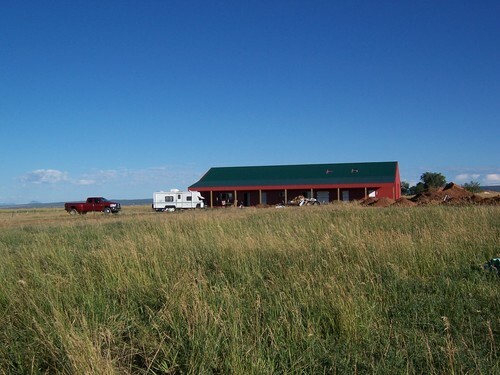 A barn was constructed on our 35 acres in Hesperus, CO. 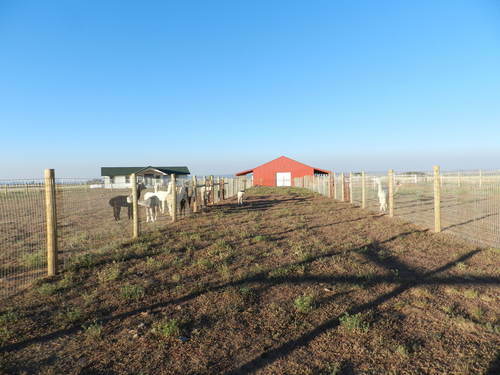 Some of the animals even have had a chance to stay at the barn this fall while being transported from the summer stay at Navajo Lake Alpacas in Ignacio, Co or to shows. They all seem quite happy with it. It has got to be the breathtaking views! 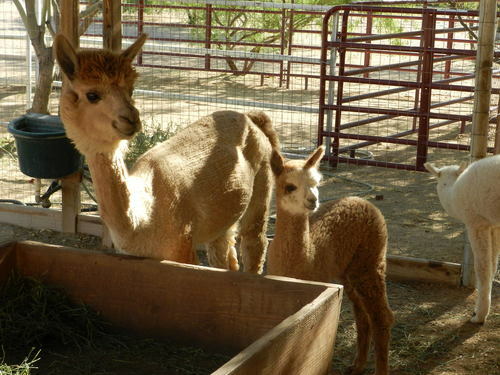 8 new cria are due for the 2011/2012 birthing season and 2 have already popped their beautiful heads out. Gunssmoke was born early on Thanksgiving Day. Graycee Spirit arrived on Dec. 9th. She lives up to her name of spirit. This gorgeous little girl is our second cria from Altitude and she shows attitude! Graycee had some issues with her little feet being turned under and walking on her ankles on three of her legs for her first 6 days. Then the miracle of nature takes over and in one day she got all of the feet under her properly and now she runs like the wind and already is exhibiting the same tall statuesque stance as her proud dad, Altitude. A beautiful medium rose grey with the classic white face, Graycee holds a very promising future. 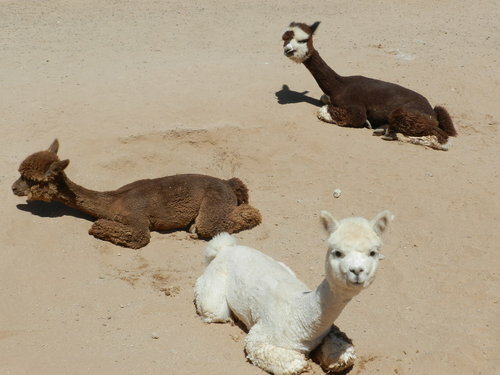 We made more new friends in 2011 and once more realized the wonderful camaraderie of the alpaca community. Thank you to our new customers that have chosen to breed their females to Altitude. 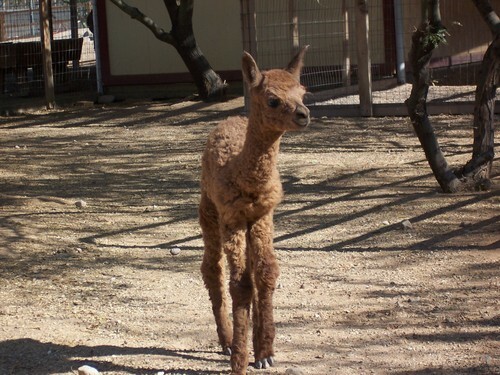 Our sincere wish is that the cria are all you hoped for! Thank you to all of our friends we have made through the years. You have all helped us along the way in one fashion or another. As we head towards our 5th year in business, we are looking forward to another exciting year. We have more cria due and cannot wait to see them. 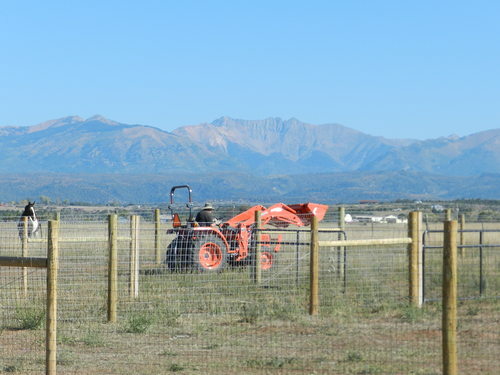 Our plans for building a house in CO are starting to come together and we are doing all in our power to be moved full time to Hesperus, CO by summer of 2012. Heck, we even bought a tractor this week (can you say tax deduction!). Check with us often to see what we are up to and how the build and move is progressing but most important, watch for our new babies. Looking forward to see lots of you in the show ring this next year for some friendly competition and to see old friends and meet new friends. yes, the pen is temporary! 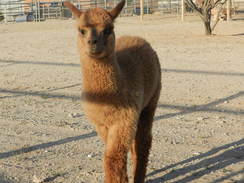 Early on Thanksgiving morning Pleasant Journey Alpacas welcomed our first cria of this season. 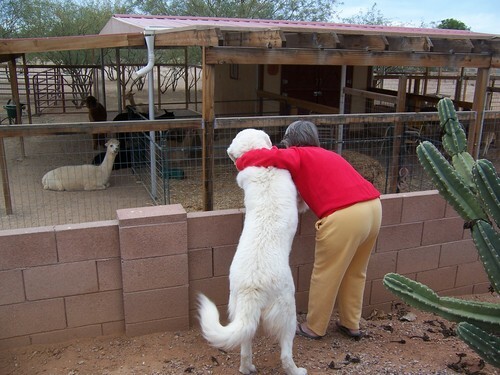 We woke to our maremma Charlotte doing a lot of barking. She barks a lot, as a good guard dog should, so we did not pay a lot of attention to what she was actually trying to tell us. We learned a valuable lesson when Glenn went out about 7:15 AM and saw our girl Bijou with her very first cria by her side. She presented us with a very nice dark fawn male that we named Gunssmoke (yes, it is Gunssmoke) sired by Aussie's Guns-n-Roses. So much for alpacas reading the book that crias should be born between 10AM and 2PM. This little one popped on the scene at about 6:00 in the morning. Bijou is a wonderful and very attentive mom who always has one eye on little Gunssmoke. And he is always keeping an eye on her too as he LOVES that milk! 1 down, 7 more to arrive between now and May of 2012. 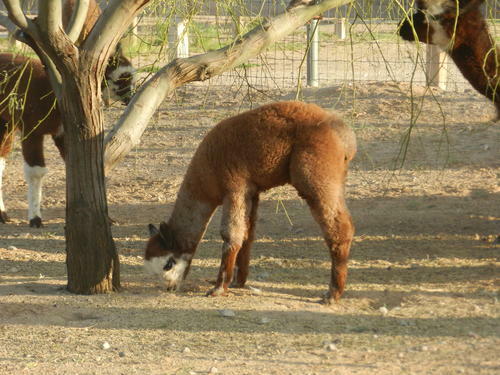 Cinnamon Stix is due with another Altitude cria for us any day now. Yes, we are excited! 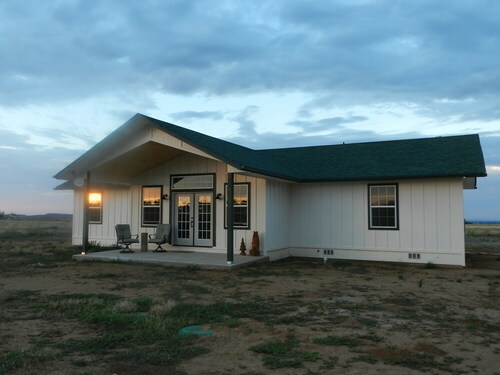 The Colorado ranch continues to slowly progress, vet / fiber rooms are ready for cabinetry and work surfaces to be installed. 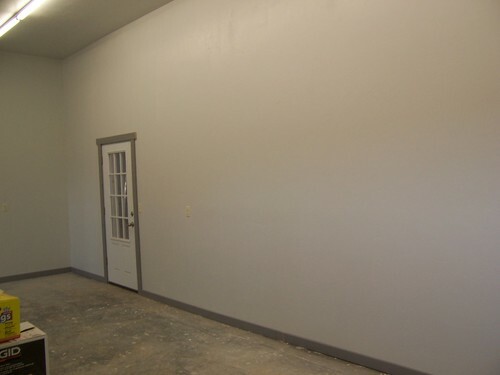 The workshop is ready for workbenches and tools to tackle the myriad of projects on the list. 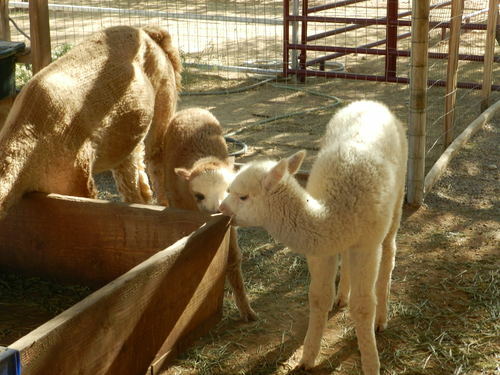 We still hope to get some time to start pens this fall between shows and the upcoming cria season. A few of our boys spent time on the ranch while we worked on some projects. 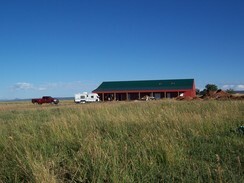 A very productive week was spent on the Colorado ranch over the first week of August. 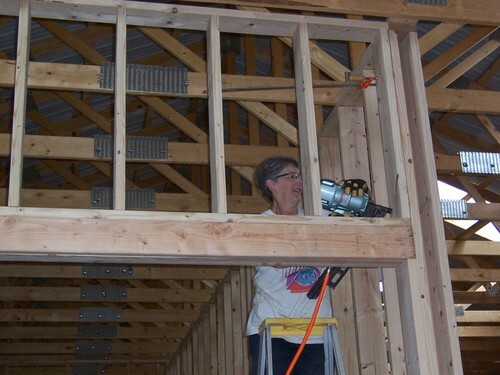 Sue got to celebrate her birthday by being on a ladder with a nail gun. Woohoo, lots of fun! 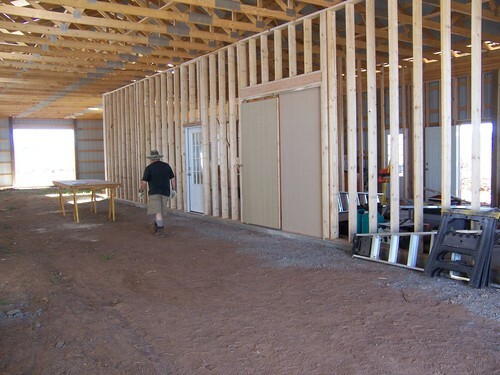 Time was spent building walls within the new barn to house Glenn's workshop, a full bathroom and a fiber/vet working room. 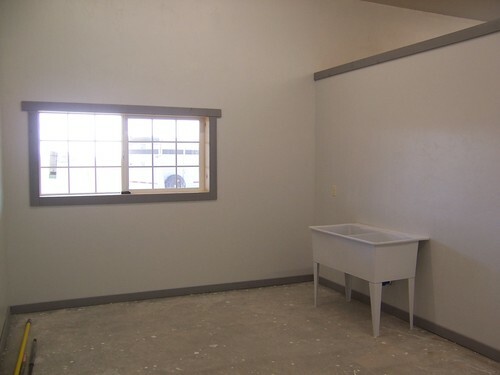 We are breaking down and going to have contractors to drywall and insulate. Time to move on the fencing and oh yes, still need to figure out how we are going to get a house built. 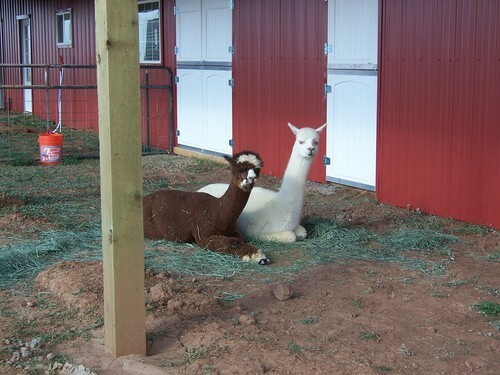 Face it, the house will be about 1/4 the size of the barn but we all know it is alpacas first, humans second. So, next plan is to spend a few days over Labor Day weekend working on fencing. Don't think that small temporary panel pen will hold too may alpacas for very long!